LENGTH: We offer trips of varying lengths to suit your schedule, from day and overnight trips to week-long expeditions. We encourage you to consider the longer trips, which provide the best opportunity to experience the character of the vast woodlands we travel through. Our guests often find they need a few days to unwind from the stresses of the "civilized" world before they're able to fully appreciate the quiet, spacious realm of the northern forest. WEATHER: The weather in our region is varied and unpredictable. It can change dramatically within a few minutes, or remain hot, cool, dry, or wet for days. We recommend suntan lotion and raingear, and clothing worn in layers you can peel off or pile on as temperatures change. INSECTS: Our peskier species can be bothersome at campsites, especially in June, but they are not normally a problem on the water, and they bed down on cool nights. They thrive in certain weather conditions, but can be managed with suitable clothing and repellent. FISHING: Maine fishing is at its peak from late May through June. As the water warms up, game species such as brook trout and salmon become harder to find. Kids can always catch a few “chub” for fun throughout the season. Sport and subsistence fishing on our Quebec trips is more reliable, with trout and exciting pike and walleye to reel in. 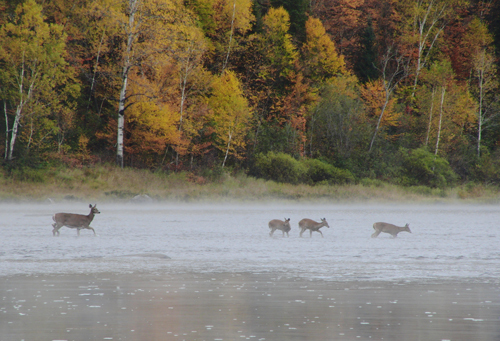 WILDLIFE: Encounters with moose and deer are common along the river during summer months. Birdlife is always plentiful; you'll be fascinated by the sudden flight of a great blue heron, the snow-white belly of a circling osprey, ducklings churning to keep up with mama, the thrilling glimpse of a bald eagle, and the pumping voice of a shy bittern. Hearing the haunting call of ever-present loons or exciting coyote songs in the night will send chills down your spine. You may even have the rare good fortune to spot our more reclusive residents: black bear, otter, beaver, bobcat, lynx or fox. 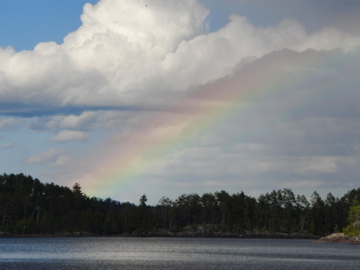 In camp, entertainment by chipmunks, red squirrels, whisky jacks, and snowshoe hares will keep you chuckling. WATER LEVEL: Most of the rivers on our itinerary can be run from May through September, although in dry years, river-reading skills become especially important. Whitewater conditions vary greatly with different water levels. The St. John is canoeable only in the spring or after a long, heavy rain. GUIDES: There are real advantages to taking your trip with an experienced guide. A guided trip gives you the opportunity to enjoy your trip in a more relaxed manner, with plenty of free time, and without the responsibilities of logistical planning, meal preparation, decision-making, camp chores, and transportation. Your guide provides and prepares all meals, furnishes all but personal gear, knows the region and its very special places, and usually charges little more than it would cost you to outfit yourself, pay user fees, arrange transportation, and supply your own meals. During a dry year our guides can lead you through the Allagash channels while other canoeists are dragging their boats over rocks for miles. 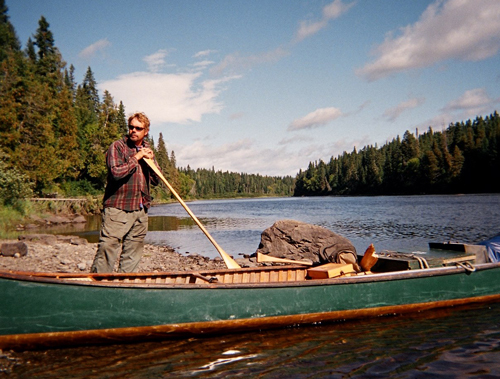 Guides can teach you more about the North Country, canoeing, and camping than you could ever glean from maps, books, and brochures (like how to use a setting pole in shallow rapids, or bake fresh breads before an open fire during a torrential rain! ).